The ice sheets of Antarctica and Greenland are huge plates of ice, thousands of meters thick in the central areas, resting on large land masses. The Greenland Ice Sheet has an area of 1.7 million km2 (about 670,000 mi2) and occupies about seven-eighths of the entire island of Greenland (Figure 17.11). The only land exposed is a narrow, mountainous coastal strip. 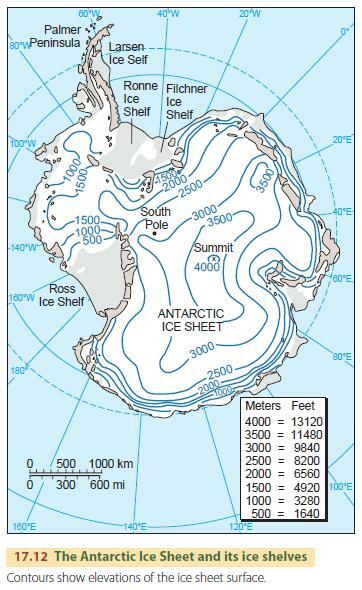 The Antarctic Ice Sheet covers 13 million km2 (about 5 million mi2) (Figure 17.12). Both ice sheets are developed on large, elevated land masses in high latitudes. No ice sheet exists near the North Pole, which is positioned in the vast Arctic Ocean. Ice there occurs only as floating sea ice. The Greenland Ice Sheet surface is a very broad, smooth dome. Underneath the ice sheet’s central region, the rock floor lies near or slightly below sea level, but it is higher near the edges. At its margins, the Greenland Ice Sheet has a number of outlet glaciers that reach the sea. The Antarctic Ice Sheet is thicker than the Greenland Ice Sheet—as much as 4700 m (about 15,500 ft) at maximum. Antarctica also has great plates of floating glacial ice, called ice shelves. Ice shelves are fed by the ice sheet, but they also accumulate new ice through the compaction of snow. At some locations, the ice sheet produces rapidflowing ice streams that feed into the ice shelves. Free-floating ice on the sea surface takes two forms—sea ice and icebergs. Sea ice is formed by direct freezing of ocean water and accumulation of snow atop the ice. The surface zone of sea ice is composed of fresh water, while the deeper ice is salty. Pack ice is sea ice that completely covers the sea surface. Under the forces of wind and currents, pack ice breaks up into individual patches called ice floes. The narrow strips of open water between floes are known as leads. Winds can force ice floes together, making the ice margins buckle and turn upward into pressure ridges that resemble walls of ice. These obstacles can make traveling across polar sea ice on foot very difficult. Icebergs are masses of ice that have broken free from alpine glaciers terminating in the ocean or from floating ice shelves. This process is called calving of the glacier. Because they are only slightly less dense than sea water, icebergs float very low in the water. About five-sixths of the bulk of an iceberg is submerged. The ice is composed of fresh water since it is formed from compacted and recrystallized snow. A major difference between sea ice and icebergs is thickness. Sea ice is always less than 5 m (16 ft) in thickness, generally 2–3 m (7–10 ft), whereas icebergs may be hundreds of meters thick. Like alpine glaciers, ice sheets are very good at stripping away loose materials and scouring bedrock. During the periods when continental ice sheets grew and spread outward over vast areas, the slowly moving ice scraped off regolith and ground away solid bedrock, leaving behind smoothly rounded rock masses. Evidence of ice abrasion—grooves and scratches left on the ground—is common throughout glaciated regions of North America. You can see signs on almost any freshly exposed hard rock surface. Sometimes the ice polishes the rock to a smooth, shining surface. The ice sheets also excavated enormous amounts of rock at locations where the bedrock was weak and the flow of ice was channeled by a valley along the ice flow direction. Under these conditions, the ice sheet behaved like an alpine valley glacier, scooping out a deep glacial trough. Ice sheets resemble huge conveyor belts. Anything carried on the belt is dumped off at the end, and, if not constantly removed, will pile up. Rock fragments incorporated into the ice are deposited at its outer edge as the ice evaporates or melts. We use the term glacial drift to refer to all the varieties of rock debris deposited by glaciers. There are two types of drift. Stratified drift consists of layers of sorted and stratified clays, silts, sands, or gravels. These materials were deposited by meltwater streams or in bodies of water adjacent to the ice. Till is an unstratified mixture of rock fragments, ranging in size from clay to boulders, that is deposited directly from the ice without water transport. Where till forms a thin, more or less even cover, it is referred to as ground moraine. Over those parts of North America formerly covered by ice sheets, glacial drift thickness averages from 6 m (about 20 ft) over mountainous terrain, such as New England, to 15 m (about 50 ft) and more over the lowlands of the north-central United States. Over Iowa, drift thickness is from 45 to 60 m (about 150 to 200 ft), and over Illinois it averages more than 30 m (about 100 ft). In some places where deep stream valleys already existed before the glaciers advanced, such as in parts of Ohio, drift is much thicker. Figure 17.18 describes the form and composition of deposits left by ice sheets. Till plains, moraines, and drumlins are formed under ice or by direct melting at the ice margin. Kames, eskers, and outwash plains are formed by fluvial action of meltwater streams. Pluvial lakes are another type of landform created by ice sheets. During the Ice Age, some regions experienced a cooler, moister climate. In the western United States, closed basins filled with water, forming pluvial lakes. The largest of these, glacial Lake Bonneville, was about the size of Lake Michigan and occupied a vast area of western Utah. With the warmer and drier climate of the present interglacial period, these lakes shrank greatly in volume. Lake Bonneville became the present-day Great Salt Lake. Many other lakes dried up completely, forming desert playas. We can work out the history of these pluvial lakes from their ancient shorelines, some of which are as high as 300 m (about 1000 ft) above present levels. Landforms associated with the ice are of major environmental importance. 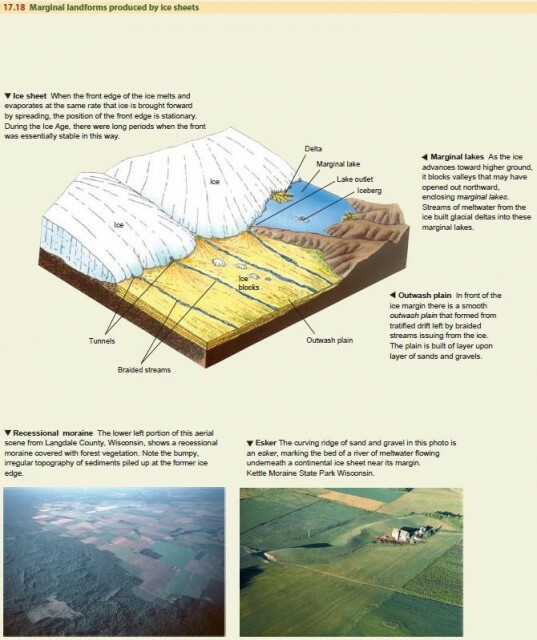 Glaciation can have both good and bad agricultural influences, depending on preglacial topography and the degree and nature of ice erosion and deposition. In hilly or mountainous regions, such as New England, the glacial till is thinly distributed and extremely stony. The countless boulders and cobbles in the clay soil make it difficult to cultivate. Till deposits built up on steep mountain or roadside slopes pose the threat of earthflows after absorbing water from melting snows and spring rains. Crop cultivation is also hindered along moraine belts because of the steep slopes, the irregularity of the topography, and the number of boulders. But moraine belts are well suited to pastures. Flat till plains, outwash plains, and lake plains, on the other hand, can sometimes provide very productive agricultural land. There are fertile soils on till plains and on exposed lakebeds bordering the Great Lakes. Their fertility is enhanced by a blanket of wind-deposited silt (loess) that covers these plains. Stratified drift deposits are also very valuable. The sands and gravels from outwash plains, deltas, and eskers are used to manufacture concrete and for highway construction. And thick, stratified drift makes an excellent aquifer, providing a major source of ground water.